After 36 months of the project S.T.R.E.E.T. ("Sustainable Transport Education for Environment and Tourism"), the S.T.R.E.E.T Toolbox has finally been completed. The goal of the project S.T.R.E.E.T., which has been funded by the European Erasmus + program, was to train an expert on mobility and sustainable tourism and thus to define a new professional figure who can work specifically in alpine tourist contexts. Students between the ages of 20 and 35 who wanted to learn new skills and abilities in the field of alternative mobility and green tourism were the target group of the project. 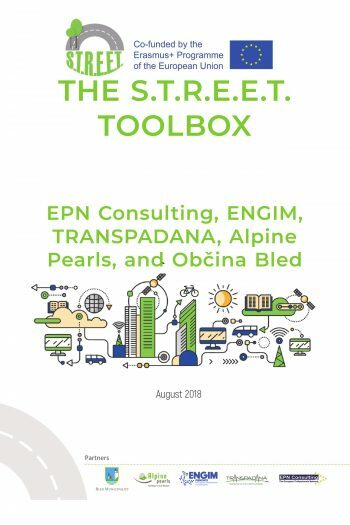 Partners and supporters of the project came from the United Kingdom (EPN Consulting), Italy (ENGIM Piemonte, TRANSPADANA), Slovenia (Bled Municipality) and Austria (Alpine Pearls). The partners equipped the participants of the project with the necessary know-how and expertise on the themes of the project. 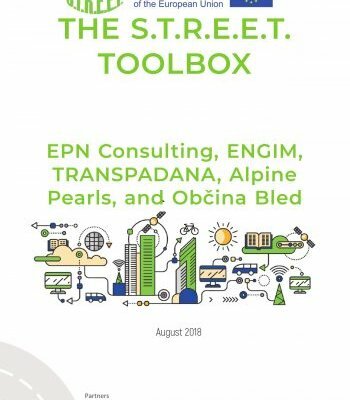 The toolbox of the project S.T.R.E.E.T is a reference book, which is the result of research and analysis conducted during the project. This handbook addresses issues in the field of alternative mobility and sustainable tourism management in rural areas and peripheral districts. As a support of the learning platform, the toolbox includes all the course content of the project as well as case studies selected by the partners. The Toolbox is a well-structured and flexible tool, edited in English and suitable to different training contexts. It represents a fundamental landmark for all participants throughout project duration (in terms of contents provided, materials, exchange of best practices, etc.) and beyond its closure. Note: The Toolbox can easily be downloaded as an e-book, so that no matter where you are, you can reinforce your expertise on soft mobility and sustainable tourism.